In the last post here on BikeProvo Jamie alluded to a certain celebrity who would be riding their bicycle through out summer. Not only would this person be riding through out summer but they would be sharing their experience with all of us some how. As it turns out we know who the person is and they will be sharing their experience through BikeProvo! So who is this mystery person? Click more for all the goods. That right, you saw and heard it here first. 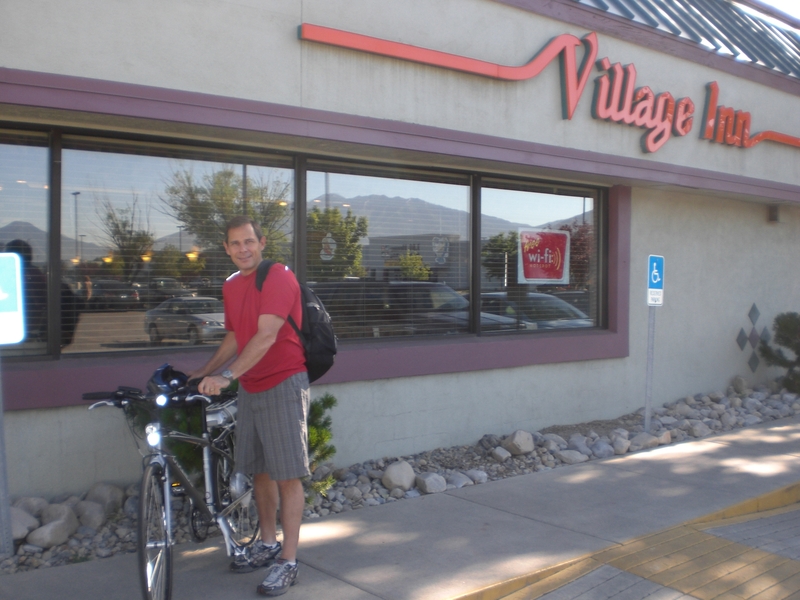 Provo Mayor John Curtis will be riding a bicycle to and from work at least once a week through out the summer. This is really exciting news for Provo! The Provo Bicycle Committee with the help of Dixon Holmes (Head of Economic Development) pitched the idea of the Mayor riding a bicycle to work through out July to bring awareness to the Clean Air Challenge. Not only did the Mayor agree to riding in July but he said he would like to make a summer series out of the ride. To help with the Mayor’s efforts Mad Dog Cycles has agreed to let the Mayor pick out and ride a new bicycle for every week in July. Not one to put off a good work or a good challenge, the Mayor is actually starting right now. Today was his first ride. He emailed in his account of the ride and even sent us the awesome picture above. Here is how it went in his words. My morning commute has re-affirmed to me that Provo is a great place to live. This was not the normal hop in the car and mindlessly make my way to the office. It was so much more because I was self-propelled, well sort of. Yes, I road a bike to work on this gorgeous summer morning, but I did get a little help. 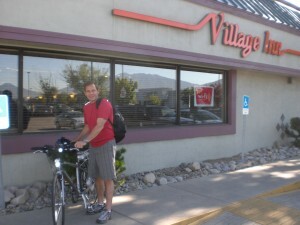 First, thanks to Zac Whitmore with the Provo Bicycle Committee for arranging for me to ride a bike, and second, for selecting a Trek, Electric Assist. Only if all bikes were this easy to ride. It actually does the pedalling for you. Well, not really, but it seemed that way. As you pedal, it has a generator that stores your power and converts to assistance as you pedal, making the whole thing seem like it is not really exercise at all. Thanks Zac and, thanks Mad Dog. Riding down Unversity Avenue was a breeze. I live just south of Will’s Pit Stop, so the short 4 mile ride into downtown was rather easy. If you haven’t taken the opportunity to ride into work every once in a while you might want to consider it. Next month is the Clean Air Challenge. The State and many other local cities and organizations are encouraging everyone to ditch the car and use another mode of transportation to get to where you need to go. While bikes are one way of getting around, you can walk, ride a skate board, roller blade, car pool, or take public transportation. The point is, leave the car at home or at least take fewer trips in the car and explore alternative methods for getting around and promote cleaner air. If you do ride, wear a helmet and obey all traffic rules. On my way into the City Center, I was pleased to see that I wasn’t the only one. I saw at least a dozen other riders, most of which looked to be in the commute mode also. While it does take a little advanced planning, riding into work is not as difficult at it seems, even if you don’t have an electric assist bike. I challenge everyone in Provo to consider doing more to improve our air quality. Riding a bike is one way. Every little effort, multiplied by many people can add up to make a big difference. Thank you so much Mayor Curtis for the great re-cap. All of us here at BikeProvo hope that the ride was good. It seems hard for it to not be with that electric assist. Also, I would agree that if you want a really good reminder or connection to how awesome Provo is just get on your bicycle and ride. We should all take note of the Mayors last sentence, “Every little effort, multiplied by many people an add up to make a difference.” That means that when you decide to ride your bicycle one time a week to work, or one time a week to the park, or one time a week to dinner, you are making Provo a better place. Make sure to follow the links to the Clean Air Challenge and see how with one ride at a time you can make a difference. Most importantly make sure to at least take the Mayors challenge to try alternative transportation in July to help our air quality and your love for our wonderful city. Thank you again Mayor Curtis, and thank you Mad Dog Cycles and Provo Bicycle Committee. This entry was posted in Bikes in the News, Local Biking Events by Zac. Bookmark the permalink. It’s great that the Mayor is working so hard to support cycling! If the leader of the city has the time to bike to work, I think we can all figure out a way to do it at least once and a while. I’m not so sure about the electric assist bike though. Is MadDog starting him out easy and working up? Week 1: electric assist. Week 2: mountain bike. Week 3: unicycle. hehe.